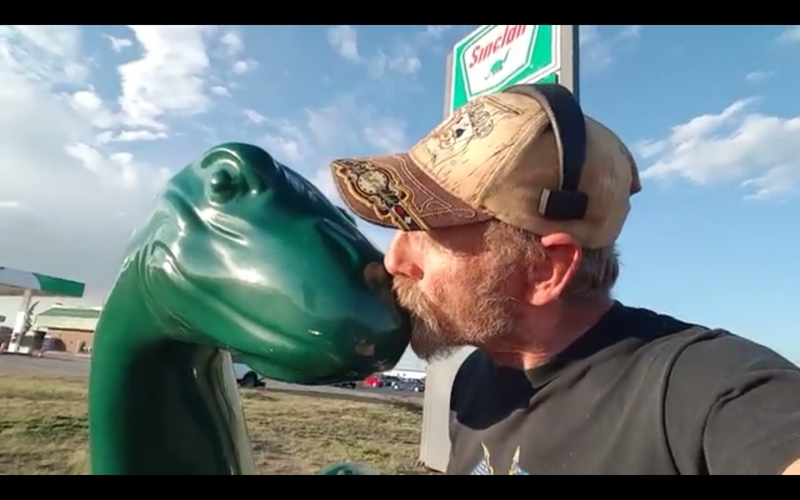 Sinclair inflatable dinosaur and autographed 4×6 photo of the action! 20in long x 8.5in high, hanging tab, sinclair logo. As some of you may or may not know, I live in the State of West Virginia, in the eastern half of the United States, and there was a time in the first eight or so years of my life when Sinclair gasoline was sold in this part of the country. In those years, coal was a booming business, and there were probably eight or nine little stores up and down the river where I grew up, including a couple of Sinclair stations. I can remember being fascinated by the shape of the five-sided sign, and the little dinosaur symbol at the bottom. I seemed to be able to talk pretty good for my age (3 to 5 years old, maybe) but I either had trouble trying to say certain words, and “dinosaur” would come out as “dino-sotter!” (The things we can remember from our early years when we are adults can be pretty amazing sometimes!) I was around seven or eight years old when the Sinclair signs disappeared and were replaced by blue Arco signs, as Atlantic Richfield won territorial rights to sell their brand of gasoline for a few years until Southern States bought them out. Anyway, the coal boom eventually turned to bust, and one by one the store/gas stations started disappearing, including both of the Sinclair locations. For some time I wanted to find some kind of Sinclair collectible, to remind me of my early days, and now Big Rig Steve offers us this inflatable Sinclair dinosaur, complete with an autographed photo of “the dinosaur kiss” that took place at a Wyoming truck stop in answer to a $50 challenge from one of the Road Crew. True, you have to have a pretty healthy set of lungs in order to inflate it, but the air valve is especially designed so that air does not escape before you can plug up the valve. It also comes with a patch kit in case of accidental puncture, so that will come in handy. This inflatable will be the centerpiece of a display I am creating of things related to Big Rig Travels, including a 1:58 sized Freightliner Cascadia truck, BRT bumper stickers, and a coffee mug with the “Mash It” sign that a family member painted for me. 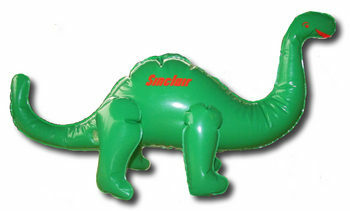 I had one of these Dinos when I was a kid….it brings back childhood memories….I had to have one.